Our session this past Friday the 12th was our most well-attended session in our history! We were joined by four young ladies from the Rochester area, as well as a couple of additional high-school competitive shooters. It says a lot about our program that we have kids coming a distance just to participate – there really are very few programs like ours anywhere in Western New York and the parents of the kids from Rochester were very complementary and grateful for our efforts. The club should truly be proud of what we’re doing for kids and their families. 1st Place – 77 – Al H.
1st Place – 67 – Carl B. Ten X and the Youth Shooting program on TV! For Spectrum cable subscribers in Erie & Niagara counties, tune in to channel 1303 (LCTV) on Wednesday, April 3rd @ 4pm when Ten X President Peter Vasilion and Ten X Competitive Team Coach Leif Johnson are interviewed on Outdoor Beat with Bill Hilts, Jr. Bill writes on outdoor sports and news for The Buffalo News and is a regular contributor on WBEN and WLVL radio. Peter and Leif will be discussing the youth shooting program at Ten X, the changes that have occurred in the NY State High School shooting sports programs, as well as how and why we started a youth program at Ten X. This is fantastic publicity for both the club and our youth program. Bill has already invited us to return as guests on the show later in the year. We also hope to have Bill come speak to a general membership meeting in the coming months, where he will discuss issues of interest for shooters, hunters, fishermen and general outdoor enthusiasts. Continue reading Ten X and the Youth Shooting program on TV! Happy near-spring to our members! Our next general membership meeting will be April 1, 2019 at 7:30 PM at the indoor range. As always, a printable PDF version of this newsletter can be downloaded by clicking this link. A paper paper newsletter will be mailed out this month with the combination to all members in good standing. If you read this, but do not receive a newsletter in the mail in April, that means that you owe dues or work assessments. Please contact our Treasurer, Martin, who can help make things right. His email is tenxtreasurer@hotmail.com. Lots happening with our Youth Shooting Program! 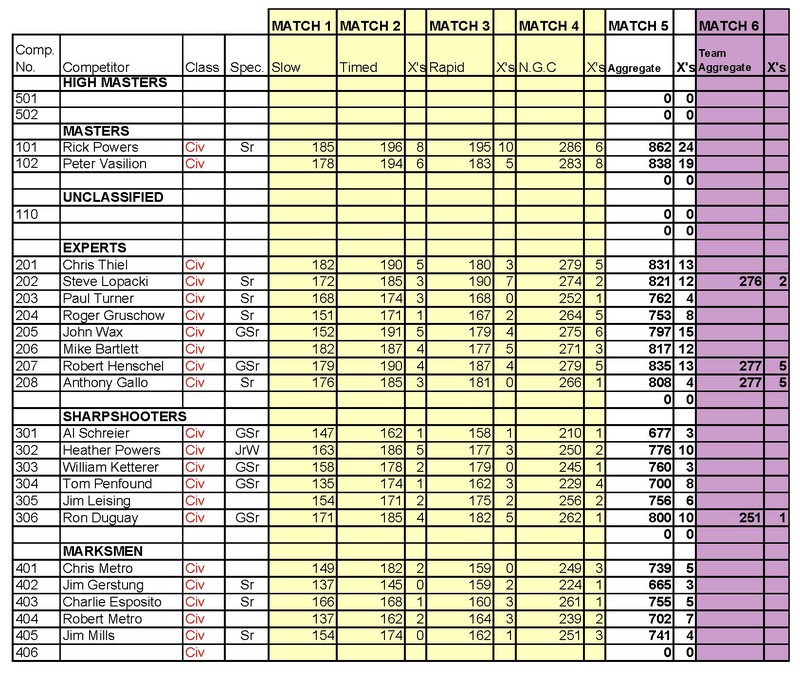 The Preliminary Bulletin for the 2019 NRA Precision Pistol Sectional is posted below. We will be submitting scores to the NRA on or about March 18, so shooters are encouraged to review the results and advise if they have any discrepancies. Discrepancy reports received after 3/18/19 may not be honored. We are still concerned about slipping attendance. We really would like your feedback on the Match. What did we do wrong? What did we do right? If you want to submit comments anonymously, send them to our PO Box address: Ten X Shooting Club, PO Box 226, Lancaster, NY 14086. A printable PDF copy of of the results can be downloaded by clicking this link. We received some great news this past week for our program. Our grant request to the NRA Foundation has been awarded and we will be receiving a 36 gun safe for the program. This is our third NRA grant in three years and to receive an item as significant as a safe means that we’ll be able to continue to receive additional firearms that we are pursuing from some now defunct programs. We are extremely grateful to the NRA Foundation. We also want to give a special thanks to Ten X Member and Youth Program Instructor Dave Scranton, whose company Scranton’s Thruway Builders Supply has graciously agreed to take delivery of the safe for us and thanks to Charlie Fissler for delivering it over to the club. This saved us a significant out of pocket expense. Our next youth shooting session will be this coming Friday the 22nd starting @ 6:30pm. Air rifle shooting and BB gun shooting in the upstairs range and 22lr smallbore in the lower range.